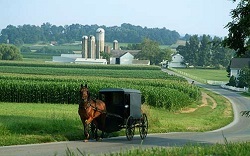 Experience the Amish lifestyle and learn about their history. Step into an Amish kitchen and learn cooking secrets. Meet local business owners, and savour hearty Amish style fare. Explore scenic back roads, buggies & what makes this countryside so special. You'll be busy all the time and loving every minute! Brown Bag Back Roads Tour of Amish Country. A brown bag is provided for goodies at each stop including items from Amish stores. With a local tour guide, your group will travel around to a variety of welcoming country stores and quaint shops. Each stop adding a new souvenir to your goodie bag. The Quilt Gardens, designated a top 100 Event by American Bus Association! A one-of-a-kind experience beginning annually in May and through until October. Featuring over 150,000 plants, with over 1 million blooms into 19 giant gardens planted in the shape of quilt patterns. Jayco RV Factory Plant Tour, the "RV Capital of the World" with over 50% of the world's inventory of Travel Trailers, 5th Wheels, Class C&A Motor Homes, Truck Campers and more. Guests will enjoy a plant tour through one of the many manufacturing lines. B&L Woodcraft Amish Furniture Shop, guests will be able to make their own custom wooden souvenir. Shipshewana Flea Market, known as the "trading place of America". The Midwest's largest outdoor market with over 1,000 vendors covering 60 acres. Amish Acres House & Farm Tour, enjoy the nation's only old order Amish farmstead listed on the National Register of Historic Places. Step inside and learn about the heritage, culture and history of the "Plain People". Visit includes a wagon ride to the one room Amish School for an old fashioned spelling bee. Lots of great dining options here for groups, with family style service and delicious authentic Amish style menus. Include a Broadway musical at the Round Barn Theatre at Amish Acres. Tour can be customized to fit your groups individual needs & interests.